SMOKE & ODOR REDUCING CARBON FILTER FOR CARVING DUST COLLECTOR: Finally, there is a great way to reduce smoke while using an electric wood burning tool! Wood burning (pyrography) is fun but the smoke it creates can aggravate allergies. The answer is to use this carbon smoke filter to reduce the smoke and odors. 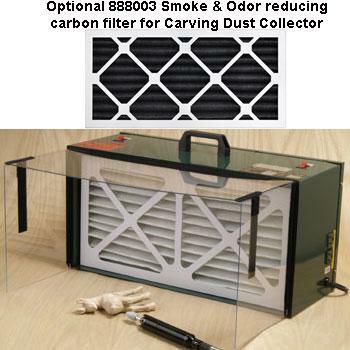 This optional carbon smoke reduction filter fits the 888001 or 881231 Carving Dust Collector. Note: This is the carbon filter only, it requires the 888001 or 881231 Carving Dust Collector. Filter size: 9.5×19.5×1 (495mm x 241mm x 25mm). Made in the USA.